Cox Automotive Industry Update Report: June 2018 - Cox Automotive Inc.
ECONOMIC INDICATORS: Economic growth is strong, but consumers are spending more than they make, so the growth we have been enjoying is likely peaking. 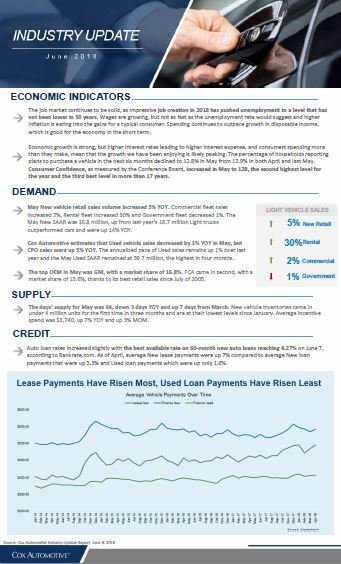 DEMAND: New vehicle retail sales volume increased 5% YOY and Used vehicle sales decreased by 1% YOY. SUPPLY: The days’ supply for May was 64, down 3 days YOY and up 7 days from April. The 2018 Cox Automotive Industry Update Report shares Cox Automotive’s multifaceted insight into the automotive marketplace to provide an overview of economic indicators, supply, demand, credit and other vital topics and trends affecting the industry. Download the June 2018 Cox Automotive Industry Update Report to learn more.